Lily Tomlin and Jane Wagner have been professional and personal life partners since they first met in the early ‘70s. 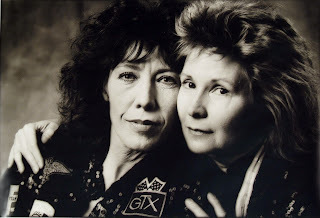 Together they have created many iconic, award-winning projects, such as Lily Tomlin and Edith Ann TV specials and recordings, the Broadway shows, Appearing Nitely and The Search for Signs of Intelligent Life in the Universe, films like The Incredible Shrinking Woman and so much more. They are now introducing their characters to a whole new generation of soon-to-be loyal followers by joining the tech revolution with City Adventures with Edith Ann, a iTunes mobile phone app for kids. 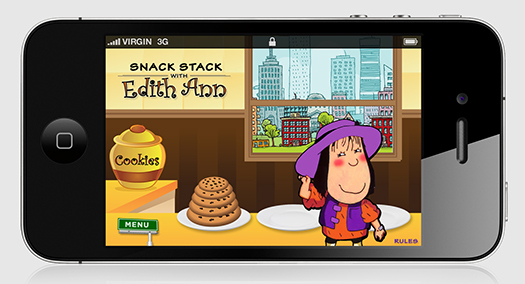 The app consists of four different games — Snack Stack, aMAZing maze, Word Wall and Bug Rescue. Lily and Jane hope the product will be educational as well as fun. And now they hope the same thing happens with the app, “We want the parents to become kids again as they might have been when Edith Ann was first invented and they grew up with her, for them to have the same wonderment that a six-year-old does. Through Edith Ann, we hope they can come back to the empathy that they lose as they become grown-ups. We thought it was a way that they would be able to experience that in a poetical way without being self-conscious about it. People grow up and become adults and lose their wonderment and idealism. They become cynical or jaded, where the kid might still believe that something very good could happen." And while Lily and Jane have joined the world of social media, they like to reflect on the days when they connected with their fans the old-fashioned way — street theater. Lily recounted a time in the ‘70s when they were opening their first Broadway play, Appearing Nitely. At the time, their young fans were sleeping outside the theater overnight to get into the show. Lily dressed up as Mrs. Beasley in a Red Cross volunteer uniform and walked through the crowd, handing out donuts and coffee to her fans. And they certainly have done that and more. In addition to the app, Lily can he heard as the loveable Ms. Frizzle in the new DVD release of The Magic School Bus series, is currently on the Showtime series, Web Therapy and will premiere on ABC's Malibu Country in the fall. They are releasing a 25th anniversary edition of The Search for Signs of Intelligent Life in the Universe next month. Lily also just finished filming the new Tina Fey/Paul Rudd movie, Admission and is regularly touring the country doing live shows. See what they have done with Edith Ann by downloading the City Adventures with Edith Ann app available on iTunes. Find out more about Lily and Jane on Facebook, Twitter and on their website, LilyTomlin.com.